One of the best meals I ever ate was in February 2016 at Hearth in the East Village. It was also the coldest weather I have ever experienced. It was negative degrees outside, and snowing. Kyle had made reservations for us a couple of weeks prior for Valentine's Day but then the weather turned mercilessly cold and we debated on whether or not to even go. Ultimately, we decided it would be worth trekking out into the icy blast - but only if we drove there from our West Harlem apartment (which we never did) because no way were we going to take 3 subways to get there in that cold. When we got there, we both believed we would most likely not find any parking and have to drive back. But we did find parking, and only a couple of blocks away! Stepping out of the cold and into a small, cozy, warm restaurant where you know you are about to eat really good food - it doesn't get much better than that. We ordered the mushrooms, calamari, and the spatchcock roast chicken for 2. They cooked the chicken under a brick from what I remember, and what resulted was the juiciest, tenderest meat of my existence. My eyes were then opened to the beauty of simple roasted chicken. It was one of the best meals ever! And while part of this experience may have been deluded due to the fact that it felt like negative fifteen degrees out and we were starving, it was one of the most memorable experiences we had while living there and we still talk about it to this day. I really love whole roast chicken, and when you spatchcock* it (remove the bird's backbone), it cooks faster and more evenly than if you did not. It also develops a delicious crispy skin that could be better than some bacon (Yeah! I said it!). Squeeze the pulpy roasted lemons on top and you have dinner in less than an hour, and maybe leftovers for the week. Plus, this is Whole 30 approved if you are into that! The hawaij seasoning is special. I've used it on this site before, but basically it is a yemenite spice blend mix of cumin, turmeric, pepper, and spices like cinnamon and cloves. It works really well in soups and on seasoning meats, and is especially cozy during the winter months. *There is a video above of how to spatchcock a chicken - hopefully it doesn't gross you out too much. 30 minutes prior to cooking, set out the chicken from the refrigerator on a large baking sheet, breast side up. Pat dry with paper towels. Flip the bird over so that the backbone is facing up. Using sharp kitchen shears, cut alongside the length of the backbone on one side. Carefully maneuver the shears through the skin and any rib bones. Cut along the other side until you have successfully removed the backbone from the chicken. Place the backbone in a plastic bag and set in the freezer - it will make a delicious stock later! Flip the bird back over so it is breast side up. Place your palms directly on top of the chicken breasts, and push down with some pressure until you hear a little pop or crack. This breaks the breastbone so the chicken will lay more flat, allowing it to cook more evenly. Congrats! You just spatchcocked a chicken! Mix together the olive oil, Hawaii seasoning, and salt in a small bowl. Drizzle all over the bird, and smear with your hands. Make sure to get underneath the skin and on the underside of the bird - cover the entire thing. 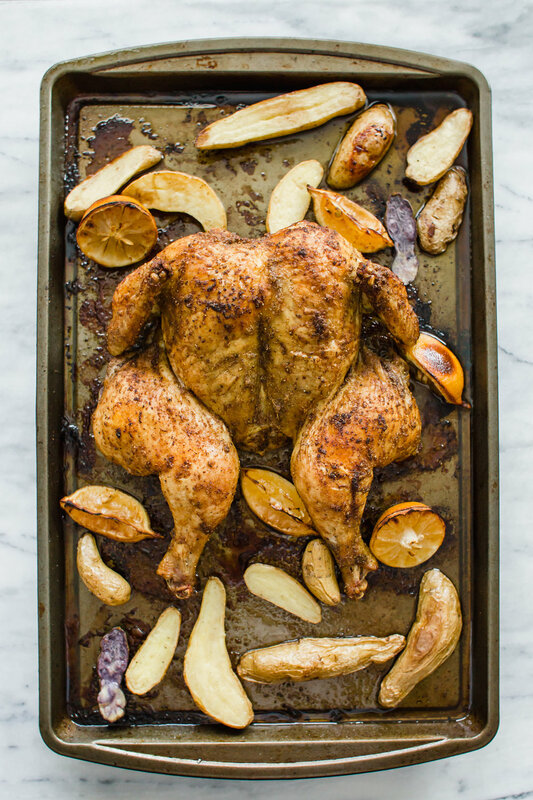 Add lemon wedges to the baking sheet, and put the whole thing in the oven. After 20 minutes, take the sheet pan out and add the sliced fingerling potatoes. Toss the potatoes in the juices from the chicken, and sprinkle generously with salt. Return back to the oven for another 25 minutes, or until chicken is cooked through and juices run clear. For a 3 1/2 - 4 lb chicken, this should take a total of 40 - 50 minutes. 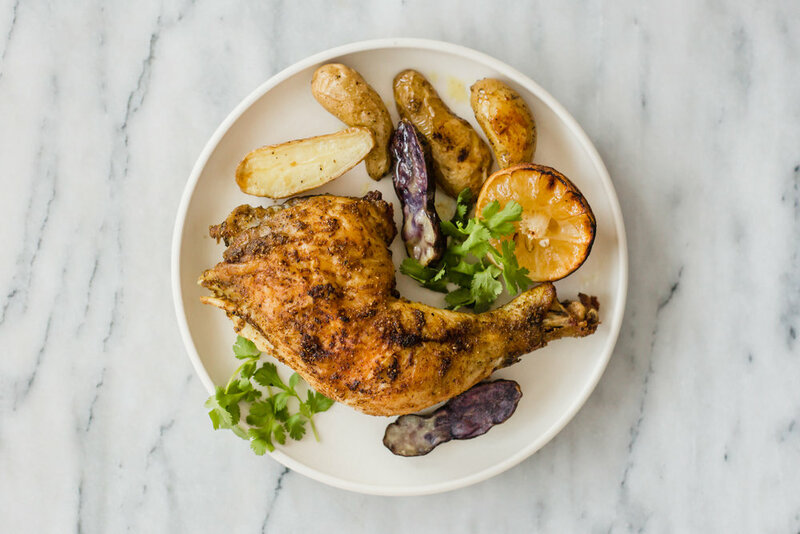 Let chicken rest for 10 minutes, then cut up into pieces and serve with the potatoes, and maybe a side salad.